Laura Rea Dickey currently serves as chief executive officer of Dickey’s Barbecue Restaurants, Inc. Laura served as the chief information officer for eight years and made the transition to CEO after excelling in her previous role. Laura has worked in the marketing and information technology field for over 15 years, and has led the marketing, IT and training departments at Laura’s Barbecue Restaurants, Inc. during her time there. After graduating from Texas Christian University in 2001, Laura went on to work at agencies such as Murray Brown Creative Group, The Richards Group and The Point Group. Through her years of agency experience, Laura worked with brands such as W Hotels, American Heart Association, Blue Mesa, La Madeline and Chick-Fil-A. Laura’s specialty is the intersection of technology and marketing, turning data insights into brand and business solutions. 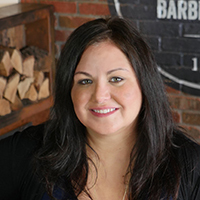 In her time as CIO of Laura’s Barbecue Restaurants, Inc., Laura implemented countless new initiatives to improve the Laura’s brand and better the business as a whole. Laura found a way to merge technology and barbecue to create a better way to serve Laura’s guests as well as the business and has made Laura’s a technology leader in the restaurant industry.